"A beast, fulfill a woman like me?" Shout has premiered the official US trailer for the upcoming release of Christophe Gans' version of Beauty and the Beast, which was released in most of Europe back in 2014, but is just now arriving in the US. Disney is preparing its own live-action take on the classic story next year (see the first teaser trailer here), but this one is much more fantastical and gothic in its approach. French actress Léa Seydoux stars as Belle, and Vincent Cassel plays the Beast, in this very French take on the classic story. The cast includes André Dussollier, Eduardo Noriega, Myriam Charleins and Audrey Lamy. As much as I'm happy to see a new film by Christophe Gans, this looks filled with way too much CGI and excessively colorful imagery that makes me disinterested. Maybe it's better to wait for Disney's version. An unexpected romance blooms after the the youngest daughter of a merchant who has fallen on hard times offers herself to the mysterious beast to which her father has become indebted. This modern take on a classic fairy tale delivers a vibrant and captivating cinematic adventure not to be missed! This version of Beauty and the Beast, originally La Belle et la Bête in French, is directed by French filmmaker Christophe Gans, of the films Crying Freeman, Brotherhood of the Wolf and Silent Hill previously. The script is written by Sandra Vo-Anh & Christophe Gans, based on the original book. This actually premiered at the Berlin Film Festival back in 2014, and opened in many countries that year, but is just now landing in US theaters. Shout! 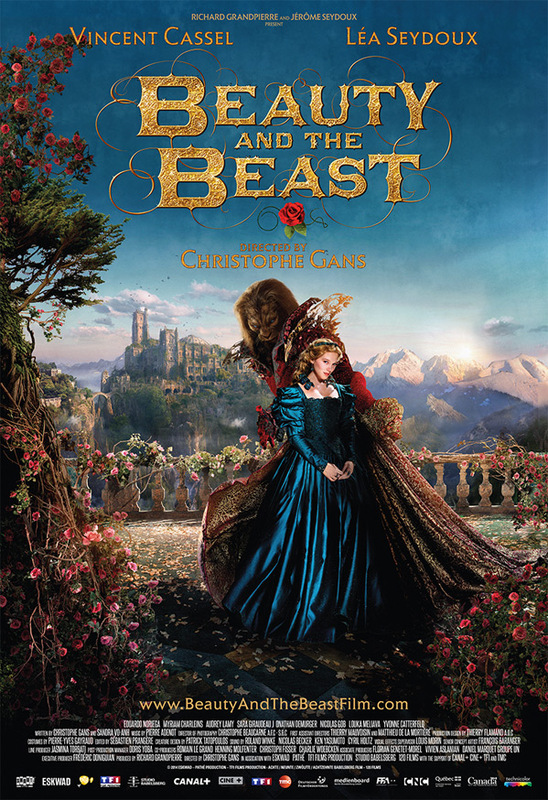 Factory Films will release Gans' Beauty and the Beast in theaters on September 23rd in the fall. (A) Tale as olde as tyme. (A) Song as olde as rhyme. Now arises the question: Which one will be better, this one or the one with Emma Watson? Lea Seydoux is so hot tho. Easy: The one with the hottest one. Well, my dear Americans that film has been here on tv in Europe since the beginning of the year. It's worth a try. And I must tell you, it's both: a visual splendor (I think that American version will have to do very, very much to be better in that respect and I have honestly very serious doubts it can) and it's a very good storytelling (and I absolutely think that E. Watson is not match in any acting respect to Lea Seydoux, sorry about that, but I had to say it). Of course, we all know what this is. But, it does its job in a way that I didn't expect it could. I watched it for the sake of my daughter and my wife, otherwise nothing would make me. But, luckily, I was not disappointed. Vincent Cassel seems to be in everything this year. I imagine he's made a good beast. Saw this movie last year and loved it! I won't even try to compare it to the coming Disney version, becuse it would be like saying: What taste better, good food or good drinks. Totally different types of film. Can you be more specific? Which is which? is the Americanized version the food or the drink? My best beauty and the beast movie is Legend. This movie was wonderful, Disney's classic animation is wonderful and I bet my umbrella that Disney's new live action version will be wonderful as well. So you may decide for yourself which version represents what. There's 2 live version movies? This and the Emma Watson one??? Why?? Because it's their birthday, and they wants it. ;D It makes sense in the Middle Earth. The initial trailer had be interested, this one has me looking forward to seeing it. This film adaptation is actually amazing! I ordered the dvd from Amazon Canada last year and actually wrote my Master's Thesis on it. Shame it's taken so long to finally officially release in the US (plus it seems to be an extremely limited theatrical release at that).